Avast Pro Antivirus is an ICSA-certified antivirus application designed as a complete solution for home and small offices. 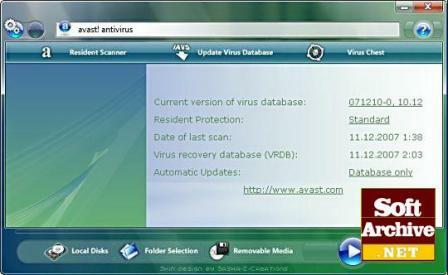 - The friendly, intuitive controls allow you to easily customize your antivirus. - Play and surf uninterrupted with Silent Gaming Mode that makes sure you don’t get any notifications or changes to system performance while it’s enabled. - Worry-free online banking and shopping through SafeZone that creates an isolated virtual window on your desktop through which you can perform secure financial transactions. - The Sandbox feature also allows you to run applications and surf the web in a virtual, isolated environment. - The Web, IM and P2P shields enable a safer instant messaging, social networking and file sharing. - Real-time protection, reinforced by frequent automated updates performed through hybrid cloud technology. - The cloud-based FileRep function keeps reputation data for a large number of files, comparing your files with its database so you know if a file is dangerous before opening it. - The Remote Assistance feature allows you to receive remote technical support from a friend or family member. - All 32 and 64-bit editions of Windows 7 and Windows 8. - All editions of Windows Vista except Starter Edition. - 32 and 64-bit editions of Windows XP SP2 and higher.